The struggle for the desegregation of transportation has a long history in the United States. Below are some key individuals and organizations who took a stand against segregated transit. In 1841, Frederick Douglass and his friend James N. Buffum entered a train car reserved for white passengers in Lynn, MA. When the conductor ordered them to leave the car, they refused. Douglass’ and Buffum’s actions led to similar incidents on the Eastern Railroad. Widespread organizing led Congress to grant equal rights to Black citizens in public accommodations with the Civil Rights Act of 1875. However, the Supreme Court overturned this victory in 1883, declaring it unconstitutional. Learn more. Maggie Lena Walker was an African American entrepreneur and civic leader who broke traditional gender and discriminatory laws by becoming the first woman—white or black—to establish and become president of a bank in the United States—the Saint Luke Penny Savings Bank in Richmond. In 1904, Walker was one of the organizers of a boycott that protested the Virginia Passenger and Power Company’s policy of segregated seating on Richmond streetcars. The boycott was so successful that the company went out of business within the year. Learn more. In late March 1940, Pauli Murray and Adelene McBean boarded an old bus headed for Durham, North Carolina. For months, Murray and McBean had discussed how they could effectively challenge racial segregation. Seated in the back of the bus over the wheel hub, the two young women suffered from each bump and decided to move to the middle of the bus. The driver told them to move back where they were previously seated. The two women refused and after a debate with the driver and local police, were arrested. Murray and McBean hoped the NAACP would use their case to challenge segregation on public transportation. However, the NAACP decided not to pursue her case because the judge threw out the most constitutionally relevant charge and weakened Murray’s legal case. Learn more. On March 31, 1941, Reverend Powell of Abyssinian Baptist Church in Harlem led a boycott against two private Manhattan bus lines, the Fifth Avenue Coach Co. and the New York City Omnibus Co. The bus lines refused to hire any blacks except for the job of a porter. In 1939, Powell started the Greater New York Coordinating Committee for Employment, an organization that led mass demonstrations for the employment of black workers during the Great Depression. Powell’s organization with other Harlem groups called for a boycott of the bus lines. After a one-month boycott, the bus lines agreed to hire 100 Black bus drivers and seventy maintenance workers. The agreement also required the bus lines to abide by an affirmative action policy that ensured that seventeen percent of the bus lines workforce was Black. Learn more. In the spring of 1941, the Indian diplomat Kamaladevi Chattopadhyaya sat down in the whites only section of a segregated train. When the train crossing Louisiana, the ticket collector ordered her to move. She refused to move. The ticket collector left, but soon returned. He asked her where she was from, realizing that she wasn’t an African American. She told him New York. “I mean which land do you hail from,” the collector retorted. Chattopadyaya could have told the tax collector that she was a distinguished guest of the United States. In fact, just a few months before her trip, she had tea with Franklin and Eleanor Roosevelt. Instead, she told the ticket collector, “It makes no difference. I am a colored woman obviously and it is unnecessary for you to disturb me for I have no intention of moving from here.” The collector muttered, “You are an Asian,” but did not make her move. Learn more. On July 6, 1944 Lieutenant Jackie Robinson while stationed at Camp Hood near Waco, Texas, was instructed to move to a seat farther back from the one where he sat next to a fellow officer’s light-skinned wife. Robinson refused suggesting that the driver tend to driving instead. Robinson was court marshaled for his refusal to move. At the court martial trial, Robinson’s commanding officer gave a glowing report on his character. His army-appointed defense attorney pointed out inconsistencies in witnesses’ accounts. The attorney also suggested that Robinson’s assertiveness was a legitimate expression of resentment given the racially hostile environment. Ultimately, the court acquitted Robinson of all charges. On July 16, 1944, twenty-seven-year-old Irene Morgan refused to yield her seat to a white passenger on a crowded Greyhound bus in Gloucester County, Virginia. Because the bus was bound for Baltimore, Morgan was arrested in violation of Virginia Jim Crow laws that mandated racially segregated seating on public conveyances. When the Sheriff first tried to arrest Morgan, she tore up the arrest warrant. While Morgan pleaded guilty to the charge of resisting arrest, she refused to plead guilty for violating Virginia’s segregation law. On June 3, 1946, the U.S. Supreme Court ruled in Morgan’s favor, striking down Virginia’s law in Morgan v. Virginia. Learn more. In response to the arrest and humiliation of Black women who had been arrested on buses, Jo Ann Robinson, a college English Professor at Alabama State College, helped start the Women’s Political Council (WPC). Throughout the 1940s, the WPC promoted civic involvement, increased voter registration, and lobbied city ofﬁcials to address racist policies. In 1955, the WPC played a pivotal role in the launch of the Montgomery Bus Boycott when Robinson and members of the WPC printed 35,000 leaflets on the night of the arrest of Rosa Parks and helped distribute them to 42,000 Black residents over the next few days. The flyers called for a one-day boycott that was a big success and led to the decision to continue. Learn more. On Aug. 1, 1952, Pfc. Sarah Louise Keys traveled from Fort Dix, N.J., to her family’s home in Washington, NC. During a stop to change drivers, she was told to relinquish her seat to a white Marine and move to the back of the bus. Keys refused to move, whereupon the driver emptied the bus, directed the other passengers to another vehicle, and barred Keys from boarding it. When Keys asked why she shouldn’t ride the bus, she was arrested, and spent 13 hours in a cell. Keys was eventually ordered to pay a $25 fine for disorderly conduct, was released, and put on a bus to her hometown. Her case was brought before the Interstate Commerce Commission and wasn’t settled until 1955. In Sarah Keys v. Carolina Coach Company, the ICC favored Keys Evans, ruling the Interstate Commerce Act forbids segregation. Learn more. In late March 1953, the Baton Rouge City Council passed Ordinance 222 that allowed passengers to fill up the bus on a “first come, first served” basis. This allowed Black passengers to sit in the white section of buses if it was empty. The bus drivers received the directive, but refused to comply. As a result of the drivers’ noncompliance, the Ordinance was ruled illegal because it conflicted with the segregation laws of Louisiana. In opposition, the Black community in Baton Rouge began a bus boycott, led by Reverend T. J. Jemison. The locals developed a “free-ride” network that sustained the boycott. It was a method later adopted by the Black community in Montgomery. To end the Boycott, the drivers and city council agreed to a compromise. It stipulated that the two side front seats of buses were to be reserved for whites and the long rear seat was for African Americans. The remaining seats were to be occupied on a first-come-first-served basis. The Black community agreed to the compromise and the boycott ended on June 25, 1953. Learn more. In early 1955, fifteen-year-old high school student and NAACP Youth Council Member Claudette Colvin was arrested for refusing to give up her seat. When the police came to arrest her, she told them: “It’s my constitutional right. I paid my fare.” Ignoring the response, one officer kicked her knocked the books out of my hand. The other officer her arm and manhandled her off the bus. After I got into the squad car, they handcuffed me through the window and took me to booking and put me into an adult jail. She was held for approximately three hours, until her pastor, Reverend H. H. Johnson, and mother came and bailed her out. Colvin’s arrest happened on March 2, 1955, nine months prior to Rosa Parks. Learn more. On April 19, 1955, Aurelia refused to give up her seat to a white person. Her refusal led to her arrest and imprisonment. It also led to the filing of a lawsuit, Browder v. Gayle. Four other black women were also part of the case—Susie McDonald, Jeanette Reese, Claudette Colvin, and Mary Louise Smith. All had faced racial discrimination on public transportation. Aurelia was chosen as the lead plaintiff on the case. Jeanette withdrew from the lawsuit shortly after it was filed due to pressure from the white community. Learn more. On October 21, 1955, at the age of 18, Mary Louise Smith was returning home by way of the Montgomery city bus. At a stop after Smith had boarded and seated, a white passenger boarded. There was no place for the white passenger to sit. Smith was ordered to relinquish her seat. She refused. Smith was arrested and charged with failure to obey segregation orders and given a nine dollar fine, which her father paid. 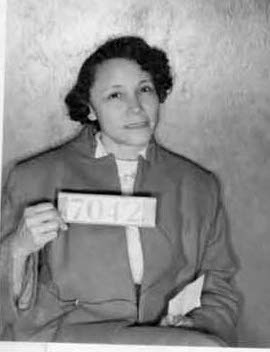 Smith’s civil rights activities did not end with her action on the bus. She, along with her sister and their children, were part of a class action law suit for the desegregation of the Montgomery YMCA. Smith also participated in the March on Washington in 1963, and the march from Selma to Montgomery in 1965. Learn more. Rosa Parks rode home on a cold December evening in 1955. When the bus driver saw that Parks was seated in a part of the bus that an area passenger referred to as ‘no man’s land’ because it was not designated white or black, he told her to “make it light on yourself” and let the driver have the seats. Parks had recognized the driver. It was James F. Blake, the same operator who had mistreated her in 1943 and she decided to ignore him and looked out the window. Parks’ decision to stay put was rooted in her history as a radical activist working with the NAACP and the Brotherhood of Sleeping Car Porters. Historian Danielle McGuire writes: “[Parks’] decision to keep her seat on December I, 1955, was less a mystery than a moment.” Far from being tired, Rosa Parks saw an opportunity to resist and she seized it. Rosa Parks’ decision pushed local leaders in Montgomery to embark on a 13-month boycott of the Montgomery Public buses that ended with the Supreme Court ruling that segregation on buses is unconstitutional. Throughout the boycott, Parks was a key organizer and helped set up taxi services and walking groups that enabled locals to continue to go to work. Learn more. On May 26, 1956, Wilhelmina Jakes and Carrie Patterson, two students from Florida Agricultural and Mechanical University (FAMU), sat down in the whites only section of a segregated bus in Tallahassee. When they refused to move, the bus drive pulled into a local service station and called the police. The Tallahassee police arrested both students, charging them with “placing themselves in a position to incite a riot.” In response, students at FAMU organized a campus-wide boycott of the city buses that attracted the support of local community members. One local community leader, Reverend C.K. Steele, helped establish the Inter-Civic Council (ICC) to coordinate the boycott. Like the Montgomery Bus Boycott, the organization created a car pool system to provide alternative transportation for local residents and students. Even with much harassment from local police, students and the local community sustained the boycott through December 1956, when he U.S. Supreme Court issued its ruling in a case that originated from the Montgomery Bus Boycott. Shortly thereafter, the Steele and other local leaders boarded the segregated buses and sat in seats reserved for whites without being order to leave. A month later, the city repealed the segregated seating ordinance. Learn more. Inspired by the Montgomery Bus Boycott, a group of West Indians in Bristol, England, organized a boycott of the Bristol Omnibus Company for its refusal to employ non-white workers on its buses. The Bristol Omnibus Company was a national company owned by British Government since 1950. Four young West Indian men – Roy Hackett, Owen Henry, Audley Evans and Prince Brown – formed an action group, called the West Indian Development Council and along with youth worker Paul Stephenson planned a bus boycott. The boycott started on April 29, 1963 and lasted for four months until the company reversed its discriminatory hiring practice. On September 17, Sikh, Raghbir Singh was the first person of color to be employed by the company, and a few days two Jamaican and two Pakistani men joined the company. The Boycott was also a key factor in the passing of Race Relations Act of 1965. Learn more. In 1965, the D.C. Transit decided to increase bus fares from 20 cents to 25 cents. Marion Barry, who came to D.C. to set up a local chapter of the Student Nonviolent Coordinating Committee (SNCC) challenged the fare increase. He argued that the fare increase disproportionately affected people of color in the D.C. area. Barry and Edgar H. Bernstein, a former member of the D.C. Public Service Commission, also argued that the fare increase only served to benefit the D.C. Transit’s return on investment and was an unnecessary increase in terms of cost. The D.C. Transit, however, was not swayed by the criticism. In response, the local chapter of SNCC, along with other civil rights organizations including the Congress of Racial Equality (CORE) and the Coalition of Conscience, planned a one-day boycott of the D.C. bus system. On January 24, 1966, an estimated 130,000 riders participated in the boycott, causing a loss of about $30,000. The boycott led officials to back down from the fare increase. Barry believed the boycott showed that “the people have power.” Learn more. The Bus Riders Union was initiated in 1992 as the Strategy Center’s Transportation Policy Group and soon began organizing bus riders in the “Billions for Buses” campaign to confront and defeat the transit racism reflected in the policies of the Los Angeles County Metropolitan Transportation Authority (MTA). In 1994, the BRU led popular protests against a massive fare hike and obtained a temporary restraining order to stop the MTA in its tracks. The BRU then sued the MTA for violating the civil rights of transit dependent bus riders. Learn more.